Comics adaptations are almost as old as the form itself, with fairy tales, novels, and other literary works having been adapted as proto-comics as far back as 19th-century Europe. Comics adaptations of nonfiction works have a shorter but no less rich history, and they invite us to rethink the comic as a literary form in ways that adaptations of fiction don’t, as essays are often structured around a central, explicit argument. Yet a failure to understand how the comics form is weaponized in the service of those arguments can lead to clumsy, eyebrow-raising results. 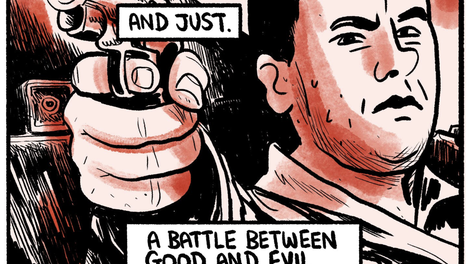 One such example is the recent comic “The Good War” (The Nib), in which cartoonist Mike Dawson adapts Chris Hayes’ essay “The Good War On Terror.” Both works posit this central claim: fetishizing of World War II in the 1990s laid the groundwork for the post-9/11 nationalist fervor that fueled the War On Terror. Hayes, to his credit, wrote the original essay in 2006—more than a decade removed from the current political moment and when opposition to the War On Terror was only just showing up in the mainstream. Dawson, however, adapts the essay at a time when it is widely accepted that the War On Terror was and continues to be a quagmire. “The Good War” begins with an unforced error: the self-imposed requirement that it justify its existence. Dawson—try as he might—proves incapable of getting himself out of the hole he’s dug himself in. And he does try. The way he dramatizes quotations and inserts them into the series of panels and exposition is particularly effective, and it speaks to the way comics can effectively reproduce, and even improve upon, the aesthetic flow of expository prose. However, it is precisely the fact that comics present a sequence of images, and that Dawson significantly compresses Hayes’ original argument, that proves fatal. 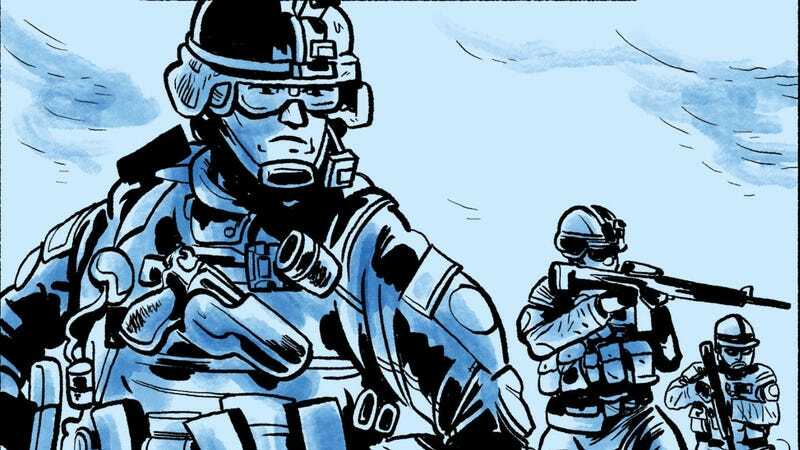 Both works expose the logic propelling the “cult of the soldier,” that belief in the unassailable morality and irreproachable capacity for members of the military to solve all geopolitical dilemmas. But Hayes does so by laying out a clear trend in the popular culture of the time. Attempting to examine “the cultural mood of the late ’90s,” he points to a number of movies, books, and television specials produced over nearly a decade, noting the way post-9/11 nationalism relied on WWII nostalgia. Dawson, however, pulls out one of Hayes’ examples—Saving Private Ryan—and makes it bear the brunt of the entire argument, returning again and again to redrawn stills and posters from the film, as well as reproduced portraits of the film’s director, Steven Spielberg. The need to make the comic visually dynamic causes Dawson to return to these images repeatedly, and he fractures Hayes’ argument as a result. While “The Good War On Terror” argues that the cultural response to the fall of the Soviet Union primed the ideological pump for our collective response to 9/11, “The Good War” posits that Spielberg is indirectly responsible for the Patriot Act, Bush’s 2004 re-election, and Abu Ghraib. When Hayes writes that “WWII nostalgia laid the conceptual groundwork for what was to come,” it means something significant. When Dawson writes that “Nostalgia succeeded in helping shift the burden of proof…” over a seemingly random drawing of Tom Brokaw’s The Greatest Generation Speaks, the message is more muddled.